AFL PROMOTION – HOW WOULD YOU SPEND $100 MILLION? Well unless you’ve been living under a rock for the last month or so you’ll know that William Hill are giving away $100 Million. 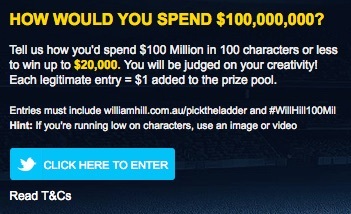 If you haven’t heard about it, William Hill are giving away $100 Million if you can pick the AFL ladder in order. Well now they are also throwing in an extra $20,000 if you tell them how you would spend that $100 Million.